Schneider, Vern Hampton joined his Savior Jesus on March 13, 2019, at age 94. Beloved husband of the late Nada Sue (Roberson) Schneider, dear father of Larry (Wendy) Schneider, Susan (Richard) Johnston, Sarah (Gregg) Hamill, adored grandfather of Tom, Alan, Richard, Will, Davis and Lelah, and friend to all. Vern was born and raised in Johnson County, Kansas. He was a graduate of the University of Kansas and a proud lifelong Jayhawk. Of lesser importance to him, he was also a graduate of Harvard Law School. A Phi Beta Kappa member, he also studied at Stanford, the University of San Francisco and Oxford. 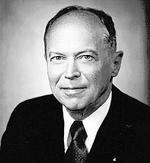 Vern served in military government with the US Army in Germany during World War II and practiced law in St. Louis for 69 years with Rassieur, Long, Yawitz and Schneider. He was an ordained elder for over seventy years and served as Clerk of Session for Central Presbyterian Church and Ladue Chapel. Vern was past Grand Master of the Grand Lodge of Missouri, past Master of Tuscan Lodge No. 360 and past president of the Masonic Home Board of Missouri. He is one of only two recipients of the Grand Lodge's Truman Medal for meritorious service to Missouri masonry. He was an avid hiker, especially in Rocky Mountain National Park, and was still hiking in the mountains into his 90s. He was a great man but a humble man. He stood for decency, kindness and integrity. He loved his family and friends. He loved God with all this heart. He will be greatly missed. Services: A memorial service and reception will be held Saturday, March 23, 2019 at Ladue Chapel, 9450 Clayton Road at 10:30 a.m. Memorial gifts honoring his memory can be made to the Masonic Home of Missouri (mohome.org) or a charity of your choice.